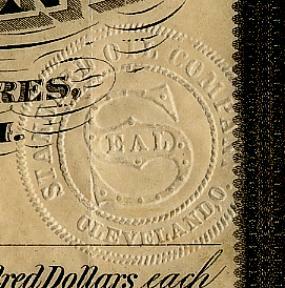 Beautiful early stock certificate (low serial #41) from the Standard Oil Company issued in 1875. 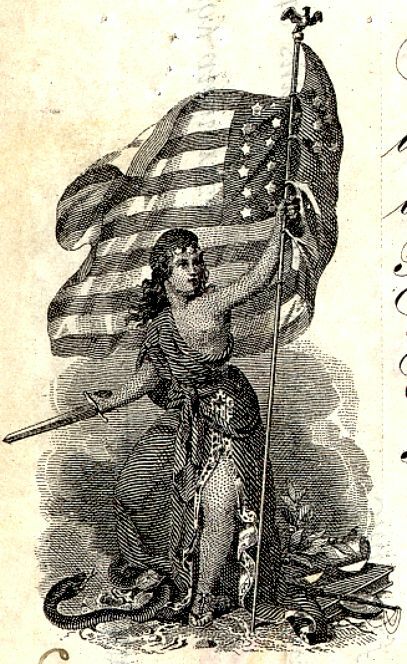 This historic document was printed by Maverick, Stephan & Co. and has an ornate border around it with two vignettes of the capitol and Lady Liberty holding a sword and an American flag. This item has been hand signed by the Company�s President, John D. Rockefeller, and Secretary, Henry M. Flagler, and is over 137 years old. 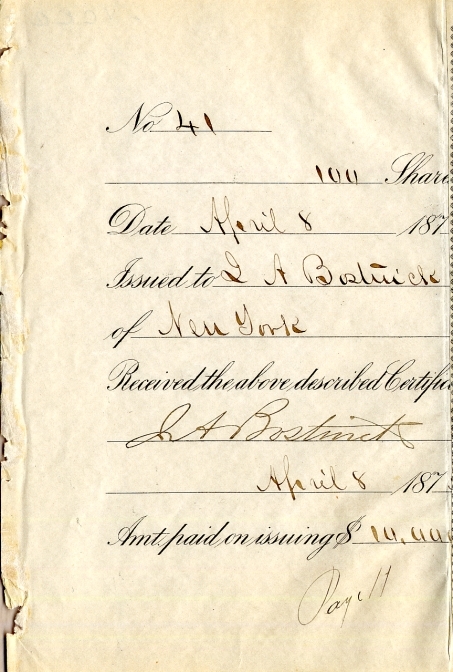 the certificate was issued to Jabez Abel Bostwick and signed by him on the left ledger and on the back. Pen cancelled. This was signed "John D. Rockefeller" and "J. D. Rockefeller" as was done later in his career. The Standard Oil Company certificates are much rarer than the Standard Oil Trust certificate. This is an extraordinary piece that doesn't come around often. John Davison Rockefeller (July 8, 1839 - May 23, 1937) was the guiding force behind the creation and development of the Standard Oil Company, which grew to dominate the oil industry and became one of the first big trusts in the United States, thus engendering much controversy and opposition regarding its business practices and form of organization. Rockefeller also was one of the first major philanthropists in the U.S., establishing several important foundations and donating a total of $540 million to charitable purposes. Rockefeller was born on farm at Richford, in Tioga County, New York, on July 8, 1839, the second of the six children of William A. and Eliza (Davison) Rockefeller. The family lived in modest circumstances. When he was a boy, the family moved to Moravia and later to Owego, New York, before going west to Ohio in 1853. The Rockefellers bought a house in Strongsville, near Cleveland, and John entered Central High School in Cleveland. While he was a student he rented a room in the city and joined the Erie Street Baptist Church, which later became the Euclid Avenue Baptist Church. Active in its affairs, he became a trustee of the church at the age of 21. He left high school in 1855 to take a business course at Folsom Mercantile College. He completed the six-month course in three months and, after looking for a job for six weeks, was employed as assistant bookkeeper by Hewitt & Tuttle, a small firm of commission merchants and produce shippers. Rockefeller was not paid until after he had worked there three months, when Hewitt gave him $50 ($3.57 a week) and told him that his salary was being increased to $25 a month. A few months later he became the cashier and bookkeeper. In 1859, with $1,000 he had saved and another $1,000 borrowed from his father, Rockefeller formed a partnership in the commission business with another young man, Maurice B. Clark. In that same year the first oil well was drilled at Titusville in western Pennsylvania, giving rise to the petroleum industry. Cleveland soon became a major refining center of the booming new industry, and in 1863 Rockefeller and Clark entered the oil business as refiners. Together with a new partner, Samuel Andrews, who had some refining experience, they built and operated an oil refinery under the company name of Andrews, Clark & Co. The firm also continued in the commission business but in 1865 the partners, now five in number, disagreed about the management of their business affairs and decided to sell the refinery to whoever amongst them bid the highest. Rockefeller bought it for $72,500, sold out his other interests and, with Andrews, formed Rockefeller & Andrews. Rockefeller�s stake in the oil industry increased as the industry itself expanded, spurred by the rapidly spreading use of kerosene for lighting. In 1870 he organized The Standard Oil Company along with his brother William, Andrews, Henry M. Flagler, S.V. Harkness, and others. It had a capital of $1 million. By 1872 Standard Oil had purchased and thus controlled nearly all the refining firms in Cleveland, plus two refineries in the New York City area. Before long the company was refining 29,000 barrels of crude oil a day and had its own cooper shop manufacturing wooden barrels. The company also had storage tanks with a capacity of several hundred thousand barrels of oil, warehouses for refined oil, and plants for the manufacture of paints and glue. Standard prospered and, in 1882, all its properties were merged in the Standard Oil Trust, which was in effect one great company. It had an initial capital of $70 million. There were originally forty-two certificate holders, or owners, in the trust. After ten years the trust was dissolved by a court decision in Ohio. The companies that had made up the trust later joined in the formation of the Standard Oil Company (New Jersey), since New Jersey had adopted a law that permitted a parent company to own the stock of other companies. It is estimated that Standard Oil owned three-fourths of the petroleum business in the U.S. in the 1890s. In addition to being the head of Standard, Rockefeller owned iron mines and timberland and invested in numerous companies in manufacturing, transportation, and other industries. Although he held the title of president of Standard Oil until 1911, Rockefeller retired from active leadership of the company in 1896. In 1911 the U.S. Supreme Court found the Standard Oil trust to be in violation of the anti-trust laws and ordered the dissolution of the parent New Jersey corporation. The thirty-eight companies which it then controlled were separated into individual firms. In his biography, Study in Power, John D. Rockefeller, Industrialist and Philanthropist, the historian Allan Nevins reports that Rockefeller at that time owned 244,500 of the company�s total of 983,383 outstanding shares. Henry Morrison Flagler was born on January 2, 1830 in Hopewell, New York to Reverend Isaac and Elizabeth Caldwell Harkness Flagler. At the age of 14, after completing the eighth grade in 1844, Flagler decided to move to Bellevue, Ohio where he found work in the grain store of L.G. Harkness and Company at a salary of $5 per month plus room and board. By 1849, Flagler was promoted to sales staff of the company at a salary of $400 per month. Flagler became a partner in the newly organized D. M. Harkness and Company with his half-brother, Dan Harkness in 1852. The following year, on November 9, he married Mary Harkness. On March 18, 1855, their first child, Jennie Louise, was born. Jennie Louise lived until 1889, when at the age of 34, she died following complications from child birth. A second child, Carrie, was born on June 18, 1858. She died three years later. On December 2, 1870, the Flaglers' only son, Harry Harkness Flagler, was born. Flagler founded the Flagler and York Salt Company, a salt mining and production business in Saginaw, Michigan in 1862 with his brother-in-law Barney York. By 1865, the end of the Civil War caused a drop in the demand for salt and the Flagler and York Salt Company collapsed. Heavily in debt, Flagler returned to Bellevue, Ohio. He had lost his initial $50,000 investment and an additional $50,000 he had borrowed from his father-in-law and Dan Harkness. The next year Flagler reentered the grain business as a commission merchant. Flagler had become acquainted with John D. Rockefeller, who worked as a commission agent with Hewitt and Tuttle for the Harkness Grain Company. By the mid 1860s, Cleveland had become the center of the oil refining industry in America and Rockefeller left the grain business to start his own oil refinery. In 1867, Rockefeller, needing capital for his new venture, approached Flagler. Flagler obtained $100,000 from a relative on the condition that Flagler be made a partner. A Rockefeller, Andrews and Flagler partnership was formed with Flagler in control of Harkness' interest. On January 10, 1870, the Rockefeller, Andrews and Flagler partnership emerged as a joint-stock corporation named Standard Oil and by 1872, Standard Oil led the American oil refining industry, producing 10,000 barrels per day. Five years later Standard Oil moved its headquarters to New York City, and the Flaglers moved to their new home at 509 Fifth Avenue in New York City. By 1878, Flagler's wife, who had always struggled with health problems, was very ill. On advice from Mary's physician, she and Flagler visited Jacksonville, Florida for the winter. Mary's illness grew worse, however, and she died on May 18, 1881 at age 47. Two years after Mary's death, Flagler married Ida Alice Shourds. Soon after their wedding, the couple traveled to St. Augustine, Florida where they found the city charming, but the hotel facilities and transportation systems inadequate. Flagler recognized Florida's potential to attract out-of-state visitors. Though Flagler remained on the Board of Directors of Standard Oil, he gave up his day-to-day involvement in the corporation in order to pursue his interests in Florida. He returned to St. Augustine in 1885 and began construction on the 540-room Hotel Ponce de Leon. Realizing the need for a sound transportation system to support his hotel ventures, Flagler purchased the Jacksonville, St. Augustine & Halifax Railroad, the first railroad in what would eventually become the Florida East Coast Railway. The Hotel Ponce de Leon opened January 10, 1888 and was an instant success. Two years later, Flagler expanded his Florida holdings. He built a railroad bridge across the St. Johns River to gain access to the southern half of the state and purchased the Hotel Ormond, just north of Daytona. His personal dedication to the state of Florida was demonstrated when he began construction on his private residence, Kirkside, in St. Augustine. Flagler completed the 1150-room Royal Poinciana Hotel on the shores of Lake Worth in Palm Beach and extended his railroad to West Palm Beach by 1894. The Royal Poinciana Hotel was at the time the largest wooden structure in the world. Two years later, Flagler built the Palm Beach Inn (renamed The Breakers in 1901) overlooking the Atlantic Ocean in Palm Beach. Flagler originally intended for West Palm Beach to be the terminus of his railroad system, but during 1894 and 1895, severe freezes hit the area, causing Flagler to rethink this original decision. Sixty miles south, the town today known as Miami was reportedly unharmed by the freeze. To further convince Flagler to continue the railroad to Miami, he was offered land from private landowners, the Florida East Coast Canal and Transportation Company, and the Boston and Florida Atlantic Coast Land Company, in exchange for laying rail tracks. Flagler's railroad, renamed the Florida East Coast Railway in 1895, reached Biscayne Bay by 1896. Flagler dredged a channel, built streets, instituted the first water and power systems, and financed the town's first newspaper, the Metropolis. When the town incorporated in 1896, its citizens wanted to honor the man responsible for its growth by naming it "Flagler." He declined the honor, persuading them to use an old Indian name, "Miami". In 1897, Flagler opened the exclusive Royal Palm Hotel in Miami. Flagler's second wife, Ida Alice, had been institutionalized for mental illness since 1895. In 1901, the Florida Legislature passed a bill that made incurable insanity grounds for divorce, opening the way for Flagler to remarry. On August 24, 1901, Flagler married Mary Lily Kenan and the couple soon moved into their Palm Beach estate, Whitehall. Built as a wedding present to Mary Lily in 1902 by architects John Carrere and Thomas Hastings, Whitehall was a 60,000 square foot, 55-room winter retreat that established the Palm Beach season for the wealthy of America's Gilded Age. By 1905, Flagler decided that his Florida East Coast Railway should be extended from Biscayne Bay to Key West, a point 128 miles past the end of the Florida peninsula. At the time, Key West was Florida's most populated city and it was also the United States's closest deep water port to the canal that the U.S. government proposed to build in Panama. Flagler wanted to take advantage of additional trade with Cuba and Latin America as well as the increased trade with the west that the Panama Canal would bring. In 1912, the Florida Overseas Railroad was completed to Key West. In 1913, Flagler fell down a flight of stairs at Whitehall. He never recovered from the fall and died of his injuries on May 20 at 84 years of age. He was buried in St. Augustine alongside his daughter, Jennie Louise and first wife, Mary Harkness. Early Oil Pioneer, Oil magnate with John D. Rockefeller in Standard Oil, father of Evelyn (Bostwick) Voronoff "Mr. Bostwick was born in Franklin, New York, September 23, 1830, and was killed in a fire at his summer home at Mamaroneck, New York, August 16, 1892. When he was a boy of ten years of age, his parents removed to Ohio where he passed his early years. His education, which was essentially of a business character, began when he was a clerk in a bank in Covington, Kentucky. Later he engaged in business as a cotton broker, and in 1864 located in New York City. He owned large cotton docks on Staten Island, where also he resided on a beautiful estate until 1877, when he purchased the property at Mamaroneck. When the oil regions of western Pennsylvania began to be developed as a new source of wealth, Mr. Bostwick became interested in several wells near Franklin, Pennsylvania, and organized the firm of J. A. Bostwick and Company, oil refiners and shippers. In 1872, when John D. Rockefeller formed the Standard Oil Company, Mr. Bostwick aided in its organization and became its first Treasurer, and shortly afterward dissolved his connection with his partner, W. H. Tilford, who also became affiliated with the Standard Oil Company. Thereafter, for many years Mr. Bostwick was the company's chief oil buyer, but in 1885 he retired from the oil business, and in 1886 was elected President of the New York and New England Railroad Company. He held this office until January, 1892. Only two weeks before his death he purchased a seat on the New York Stock Exchange. In all his affairs Mr. Bostwick showed his great ability as a far-seeing organizer. He was of even temperament, striking personality, and great charm, a sound judge of character, so that he became a model for the younger generation of Standard Oil men. He was the friend and adviser of Presidents Grant, Hays and Arthur, and supported Secretary William C. Whitney, in his plans for an enlarged American Navy. He had as well an inventive genius and patented several safety devices such as the Bostwick gate. Mr. Bostwick, whose fortune at the time of his death was estimated at $12,000,000, was always liberal with his wealth, although his gifts were made without ostentation, and many of his benefactions will never be known. He aided generously the charities of the Fifth Avenue Baptist Church, New York, of which he was a member, and built and endowed Emanuel Baptist Church, Suffolk Street, New York. While in Mamaroneck, he aided the Roman Catholic parish and other religious bodies, without regard to denomination. He also materially increased the endowments of Forrest College, North Carolina. Mr. Bostwick believed that education should make one self-reliant by the development of natural talents, that girls should have the same practical training as boys, and that the daughters of the well-to-do should be equipped to earn their own livelihood if necessary. For this reason his elder daughter, Nellie, took a thorough course in dressmaking, and Evelyn, the second child, chose the profession of surgery." American Biographical Library, The Biographical Cyclop�dia of American Women, Volume I, Daughters of America; or Women of the Century, Bostwick, Helen Celia Ford, Educational Work, page 351.